I read here just now that, pursuant to Waqar Akbar Cheema, al-Mahdī and al-Masīḥ are different. In order to refute our three arguments presented in a series of Rah-e-Huda, he propounds several narrations from aḥādīth and sayings of classical Muslim scholars. 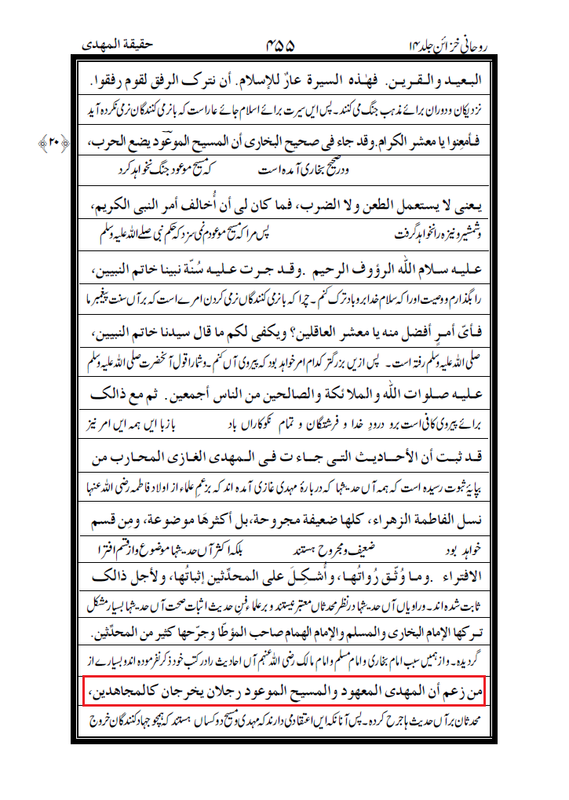 To spellbind the readers, he is actually committing such a deceitful and fraudulent way. He is not fair and honest in giving low-down. I am here therefore feeling summoned to break their shiftiness one by one. لن تهلك أمة أنا في أولها وعيسى ابن مريم في آخرها، والمهدي في أوسطها. عن عبد الله بن العبّـاس، قال: قال رسـول الله صلى الله عليه وآله سلم: لن تهلك أُمّـة أنا في أوّلها، وعيـسـى بن مريم في آخرها، والمهديّ في وسطها. “From Ḥaḍrat ‘Abdu-Llāh ibn al-‘Abbāsra, he said: Ḥadrat Rasūlu-LlāhSAW said: An Ummah, which I am in their beginning, Jesus Son of Maryamas in their end, and al-Mahdīas in their middle, will never perish”. This narration is also transcribed in ‘Iqd ad-Durar 1/218 with ta‘līq, Tārīkh Dimashq 3/394 and 4/522. All the chains are weak. I am about to discuss it one after one. “From Ḥaḍrat ‘Abdu-Llāh ibn al-‘Abbāsra, he said: Ḥadrat Rasūlu-LlāhSAW said: How will an Ummah perish, which I am in their beginning, Jesus Son of Maryamas in their end, and al-Mahdīas from my Ahl al-Bayt in their middle”. The red-coloured persons in the text above are majhūl or unknown of their ḥadīth narration, while the sky-blue signifies weak narrators. Let’s go deeper. He is majhūl al-ḥāl, nothing is grasped about his profile. Adh-Dhahabī weakens him and so does ad-Dāruquṭnī [Mīzān al-I‘tidāl 7/289; Dīwān aḍ-Ḍu‘afā’ 1/447]. Ibn al-Jauzī says the same [Aḍ-Ḍu‘afā’ Wa al-Matrūkīn 3/218]. Abū Ḥātim and Yaḥyā ibn Ma‘īn calls him liar. Ibn Ḥibbān writes that he narrates fabricated ḥadīth from athbāt (firmed persons). Al-‘Uqaylī describes him munkar whereas Mūsā ibn Hārūn weakens him [Mīzān al-I‘tidāl 2/433]. It should be cognized that Yazīd ibn Khālid al-Qushayrī here is Abū al-Haytham al-‘Umarī, not Abū al-Walīd al-Makkī who is too flimsy. The Caliph is unidentified of his narration in the science of ḥadīth. Chain of the narration is also mursal as the father of Abū Ja‘far al-Manṣūr does not directly listen to Sayyidunā Ibn ‘Abbāsra. We can thus take a conclusion that this chain is weak. Even though neither we follow nor agree with al-Albānī, Waqar must abide by him as a wahhābī. ‘Abd-ul-‘Azīz ibn ‘Alī al-Azajī says that he brings munkar aḥādīth whose isnād can not be taken as ḥujjah. Nothing is possessed about himself. But, he is tabbed somewhere a shī‘ī [Ḥayātu ash-Shaykh Muḥammad ibn Ya‘qūb al-Kulaynī 1/366-367]. He is not a man in the field of ḥadīth. Similar with the previous chain, this is too mursal as the father of Abū Ja‘far al-Manṣūr does not have a direct simā‘ to Ḥaḍrat Ibn ‘Abbāsra. Furthermore, al-Albāni also says that this sanad is muẓlim (dark) [Silsilah al-Aḥādīth aḍ-Ḍa‘īfah 5/370]. The final illation we can fetch from here is that all the narrations stating that al-Mahdīas will come in the middle of al-Ummah al-Muṣṭafawiyyah are thoroughly weak. Pertaining to the quotation of al-Munāwī, we respect him and pray for him (raḥimahu-Llāh) for his services and merits to Islām. Yet, as an ordinary man, everyone is possible to do a mistake, even if he has become a great scholar. We do not therefore agree with his statement. For, the first, it contradicts narrations informing that al-Mahdīas will appear at the last age. The second, it conflicts the use of the وسط word in Arabic language. The first point: Authentic narrations from Kutub al-Aḥādīth testify the precise time when al-Muntaẓaras will get around. أخبرني أبو العباس محمد بن أحمد المحبوبي بمرو؛ ثنا سعيد بن مسعود؛ ثنا النضر بن شميل؛ ثنا سليمان بن عبيد؛ ثنا أبو الصديق الناجي؛ عن أبي سعيد الخدري رضي الله عنه، أن رسول الله صلى الله عليه وآله وسلم قال: يخرج في آخر أمتي المهدي يسقيه الله الغيث، وتخرج الأرض نباتها، ويعطي المال صحاحا، وتكثر الماشية وتعظم الأمة، يعيش سبعا أو ثمانيا يعني حججا. Al-Ḥākim categorizes this authentic which al-Bukhārī and Muslim does not mention. حدثنا أبو معاوية؛ عن داود؛ عن أبي نضرة، عن أبي سعيد رضي الله عنه، عن النبي صلى الله عليه وسلم، قال: يخرج في آخر الزمان خليفة يعطي المال بغير عدد. حدثنا أبو معاوية؛ عن داود عن أبي نضرة؛ عن أبي سعيد؛ عن النبي صلى الله عليه وسلم قال: يخرج في آخر الزمان خليفة يعطي الحق بغير عدد. Waqar is bizarre. Earlier, he claims that al-Mahdīas will come in the middle of al-Ummah al-Muḥammadiyyah. Later, he announces that al-Mahdīas is a person from the lineage of the Holy ProphetSAW who to appear near the end of of the time. Waqar, if only you were a bit more consistent. إذا رحلت فاجعلوني وسطا، إني كبير، لا أطيق العندا أي اجعلوني وسطا لكم ترفقون بي وتحفظونني، فإني أخاف إذا كنت وحدي متقدما لكم أو متأخرا عنكم أن تفرط دابتي أو ناقتي فتصرعني. It is vivid from the light that the word means middle, not frontier nor rearward. The people of Arab usually say too وسط الحياة to express the epoch between the outset of human life and its finale [Mu‘jam al-Luġah al-‘Arabiyyah al-Muāṣirah 3/2436]. ‘Aṣr prayer is accordingly named aṣ-Ṣalāt al-Wuṣṭā in the Holy Qur’ān, for it takes time between Fajr-Ẓuhr and Maġrib-‘Ishā’. Also, the finger located between index finger (as-sabābah) with ring finger (al-binṣir) is called middle finger (al-wuṣṭā). وحدثني وهب بن بقية الواسطي؛ حدثنا خالد بن عبد الله؛ عن الجريري، عن أبي نضرة، عن أبي سعيد الخدري، قال: قال رسول الله صلى الله عليه وسلم: إذا بويع لخليفتين فاقتلوا الآخر منهما. According to several aḥādīth, al-Mahdīas is denominated a Caliph of Allāh. In another place, al-Masīḥas is named the caliph of my Ummah. So, due to al-Masīḥas’s late coming, he must be killed pursuant to the teaching of ḥadīth. Will Waqar Sahib execute this sacred task? حدثنا أحمد بن إسحاق؛ ثنا عبد الله بن سليمان؛ ثنا محمد بن خلف العسقلاني؛ ثنا الفريابي؛ عن الأوزاعي، عن عروة، قال: قال رسول الله صلى الله عليه وسلم: خير هذه الأمة أولها وآخرها، أولها فيهم رسول الله صلى الله عليه وسلم وآخرها فيهم عيسى ابن مريم، وبين ذلك ثبج أعوج ليس منك ولست منهم. This simply transmutes Waqar (noble) to be Ḥaqar (scurvy) for being dishonest and underhanded in presenting the true situation. 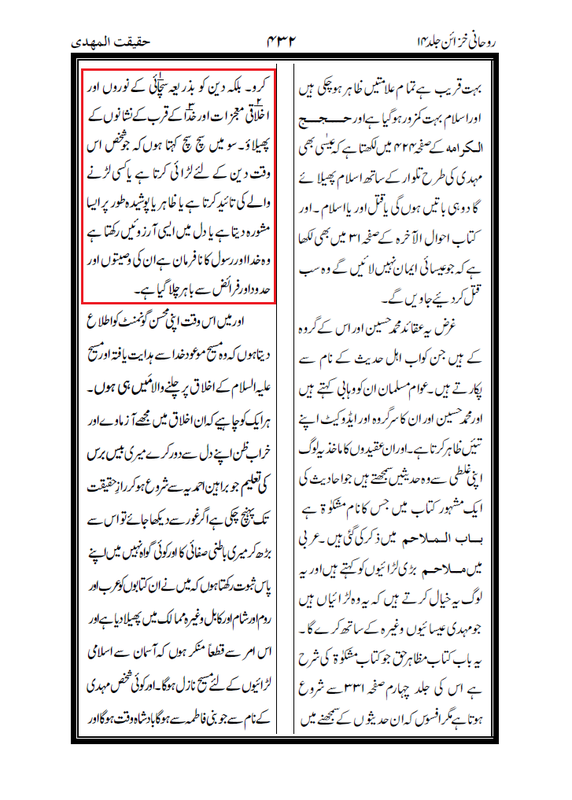 SECOND, Waqar Sahib smacks his opinion with his own statement. I am not here going to discuss one by one every ḥadīth he mentions, because it is not directly related to the essence of our talk, in spite of being mark-hitters more or less. 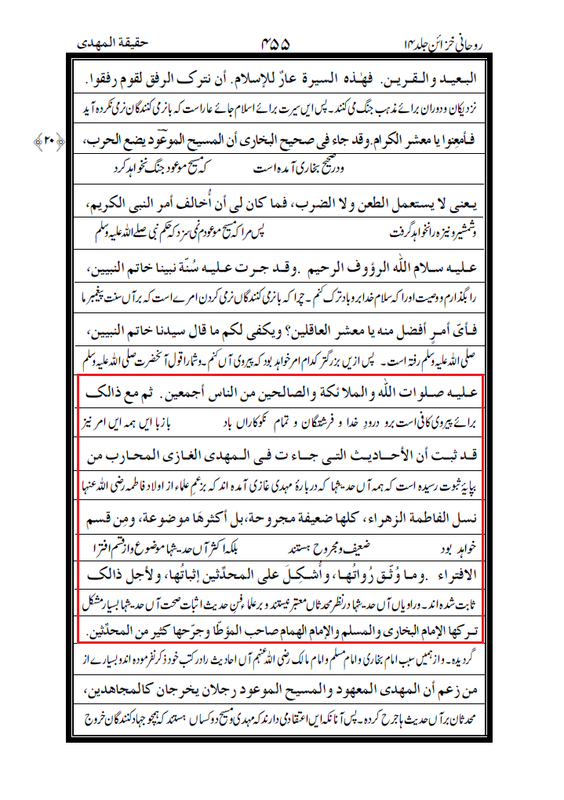 First and foremost, our argumentation copied by Waqar is ṣaḥīḥ marfū‘ mauṣūl. No need to try to weaken it. As for the issue “Imāman Mahdiyyan”, it should be perceived that it is in the office of ḥāl mubayyinah li aṣ-ṣifah in Arabic grammar (Naḥw) which explicates the status and the job occupied by Jesusas himself. 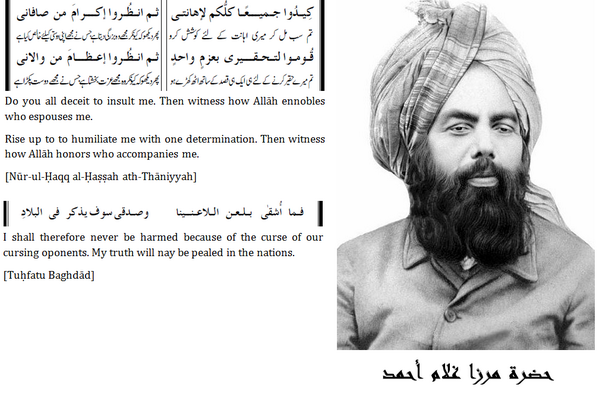 Jesusas will then come as an “Imāman Mahdiyyan” or “Rightly-Guided Imām” and a just ruler. In other words, Jesusas is practically that Imām Mahdī and that just ruler. The first point is attained. Now, when Jesusas is the rightly-guided leader, why is another man still demanded? For instance: Ahmad el-Tayib fills all the qualifications to be the Grand Sheikh of al-Azhar. His capability is no need to be questioned. When Ahmad el-Tayib meets all the requirements, why do you still search for another Grand Sheikh? حدثنا ابن بكير؛ حدثنا الليث؛ عن يونس، عن ابن شهاب، عن نافع مولى أبي قتادة الأنصاري، أن أبا هريرة قال: قال رسول الله صلى الله عليه وسلم: كيف أنتم إذا نزل ابن مريم فيكم وإمامكم منكم. أنه لا يجوز أن يكون على المسلمين في وقت واحد في جميع الدنيا إمامان لا متفقان ولا متفرقان. واتفق العلماء على أنه لا يجوز أن يعقد الخليفتين في عصر واحد سواء اتسعت دار الإسلام أم لا. ولا يحل أن يكون في الدنيا إلا إمام واحد. وإذا عقدت الإمامة لإمامين في بلدين لم تنعقد إمامتهما لأنه لا يجوز أن يكون للأمة إمامان في وقت واحد. All this shining evidences clearly break Waqar’s artfulness. 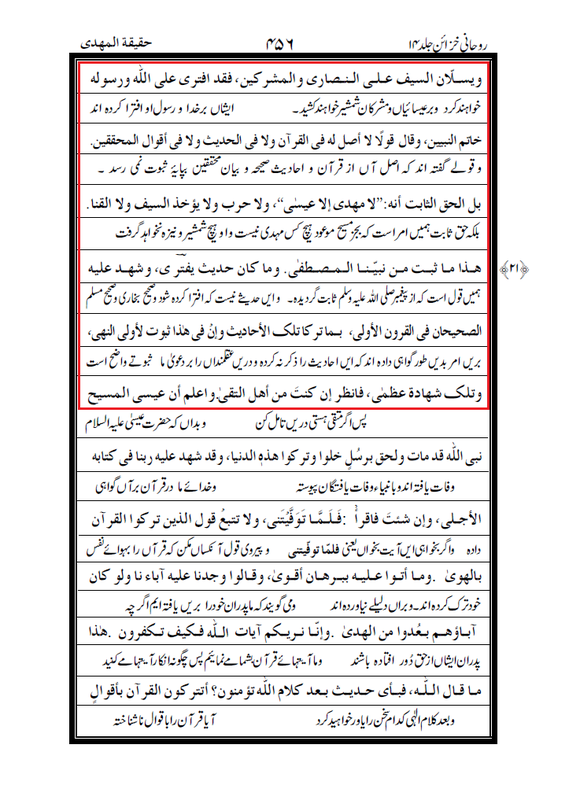 I repeat, if Waqar is still being recalcitrant, I will support him to practice the noble order to kill Jesusas as he will arrive as a Caliph after al-Mahdīas, whereas the unification of two distinct Imāms at one single time is prohibited. إنما المهدي عيسى ابن مريم، يعني المهدي الكامل المعصوم. لا مهدي كاملا معصوما إلا عيسى. لا يكون مهدي إلا المهدي الذي نسبته إلى الشريعة المحمدية نسبة عيسى إلى الشريعة الموسوية في الاتباع و عدم النسخ. We can thus take a conclusion that the correct one is: al-Mahdīas and al-Masīḥas are none else apart one Same Individual from the blessed progeny of Sayyidunā Muḥammad al-MuṣṭafāSAW. He will pick two statuses up, al-Masīḥiyyat and al-Mahdawiyyat. Al-Masīḥiyyat, which represents al-Burūz al-Īsawī, beats the tympanum of lordliness and dignity (Jalāl) to demolish evil. Whilst al-Mahdawiyyat, which represents al-Burūz al-Muḥammadī, blows the saxophone of gracefulness and beauty (Jamāl) to outspread virtue. 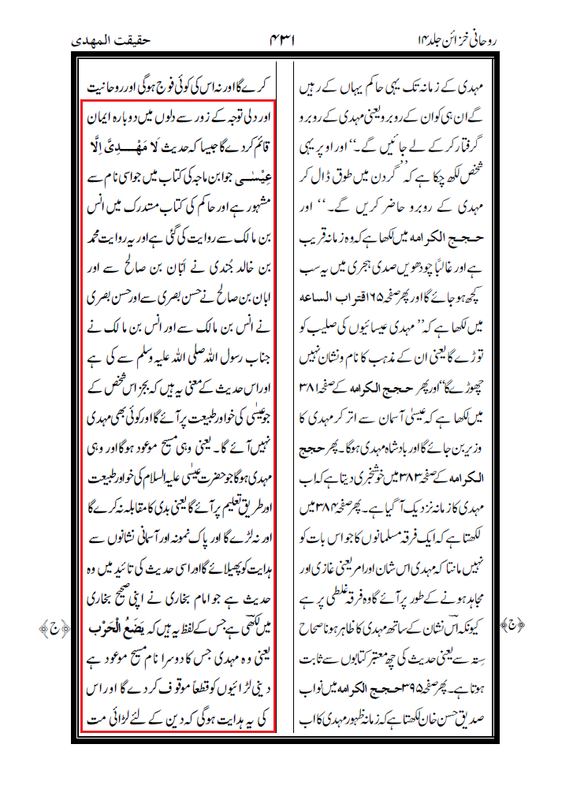 THIRD, Waqar Sahib strives to issue a classical issue about that ḥadīth. Okey, we are paying his game. Let us go deeper by following al-Albāni’s reasons to weakens it. من أكثر الأئمة من إخراج حديثه إما لإمامته، أو لكونه قليل التدليس في جنب ما روى من الحديث الكثير، أو أنه كان لا يُدَلِّس إلا عن ثقة. “Majority of Imāms posts (ikhrāj/takhrīj) his ḥadīth either for his Imāmah or for his status as a lack of concealing (qalīl at-tadlīs) beside a lot of ḥadīth he narrates. Or, he does not use to conceal apart from a thiqah”. Al-Bazzār says that the ḥadīth of a mudallis who does not narrate except from a thiqah is acceptable. When it is clear that al-Ḥasan al-Baṣrī directly listens to Ḥaḍrat Anas ibn Mālikra and he is also among the Second Martabah, the first problem is gone. I think, the biggest problem is not located at the tadlīs of al-Ḥasan, but ‘an‘anah he uses in his narration from Anasra. Some state that the ‘an‘anah of a mudallis is unacceptable. Yet, the true is that the ‘an‘anah of a mudallis will be accepted if he is lack of tadlīs and contemporary with the one whom he narrates from. ‘An‘anah itself denotes that the ḥadīth narrated is muttaṣil. Abū ‘Amrū ad-Dānī al-Muqri’ and Ibn ‘Abd-il-Barr proclaimes it to be Ijmā’ Ahl an-Naql. Abū al-Muẓaffar as-Sam‘ānī adds another requirement, length of friendship. Ad-Dānī also speaks that if a mudallis is well-known of his narration from the one he narrates from, his ḥadīth will be definitely accepted. And, as al-Qābisī says, if they have recognized each others a sure recognition [al-Bā‘ith al-Ḥathīth p. 169-170]. Al-Ḥasan, first, was described as a scant of tadlīs. The left requirements are enough with a beautiful narration from Anasra. He is once asked by someone on a matter. He replies that he should ask al-Ḥasan al-Baṣrī whilst describing him “Maulānā”. The questioner is later puzzled, then asks why. He answers, “We listen and he too listens, but we forget and he still remembers [al-Muṣannaf, Kitāb az-Zuhd, no. 34908]. It is simply to conclude that the ‘an‘anah of al-Ḥasan is accepted. Here, al-Albānī’s first accuse is proven to be absolutely false. هذا حديث مشهور بمحمد بن خالد الجندي المؤذن شيخ الشافعي، وروى عنه غير واحد أيضا وليس هو بمجهول كما زعمه الحاكم، بل قد روي عن بن معين أنه وثقه. Thereupon, what is left for you, O Waqar and al-Albānī? Third, the difference in isnād. It is actually not something that can injure. We know that this ḥadīth is centered in Muḥammad ibn Khālid. From this person, two chains flow: One from Abbān ibn Ṣāliḥ and the other from Ibn Abī ‘Ayyāsh. Abbān ibn Ṣāliḥ is a thiqah. So, even though Ibn Abī ‘Ayyāsh is forsaken (matrūk), he has a mutāba‘ah from Abbān ibn Ṣāliḥ which elevates that chain of him to higher degree. The chain of Ibn Abī ‘Ayyāsh is mursal, as al-Ḥasan does not directly listen to the Holy ProphetSAW. But, in Abbān ibn Ṣāliḥ’s chain, al-Ḥasan virtually transmits the sanad to Anasra then to the ProphetSAW. That transmission of Ibn Abī ‘Ayyāsh is thus uplifted to ḥasan li ġayrihi. حدثنا يونس بن عبد الأعلى؛ حدثنا محمد بن إدريس الشافعي؛ حدثني محمد بن خالد الجندي؛ عن أبان بن صالح، عن الحسن، عن أنس بن مالك، أن رسول الله صلى الله عليه وسلم قال: لا يزداد الأمر إلا شدة، ولا الدنيا إلا إدبارا، ولا الناس إلا شحا، ولا تقوم الساعة إلا على شرار الناس، ولا المهدي إلا عيسى ابن مريم. قال صامت بن معاذ: عدلت إلى الجند مسيرة يومين من صنعاء، فدخلت على محدث لهم، فطلبت هذا الحديث، فوجدته عنده، عن محمد بن خالد الجندي، عن أبان بن أبي عياش، عن الحسن، عن النبي صلى الله عليه وآله وسلم مثله. حدثنا أبو بكر بن أبي شيبة؛ حدثنا وكيع؛ عن مالك بن مغول، عن عبد الرحمن بن سعيد الهمداني، عن عائشة، قالت: قلت: يا رسول الله، ﴿والذين يؤتون ما آتوا وقلوبهم وجلة﴾ أهو يضاف الرجل الذي يزني ويسرق ويشرب الخمر، قال: لا، يا بنت أبي بكر، أو يا بنت الصديق، ولكنه الرجل يصوم ويتصدق ويصلي، وهو يخاف أن لا يتقبل منه. Look at the red-lined ‘Abd-ur-Raḥmān ibn Sa‘īd ibn Wahb al-Hamdānī. Abū Ḥātim and an-Nasā’ī classify him thiqah. Al-Bukhārī utilizes him in Adab al-Mufrad, Muslim and at-Tirmidhī also make him reliable [Tahdzīb al-Kamāl, 7/145]. Al-Ḥāfiẓ describes him thiqah [Taqrīb at-Tahdzīb, p. 580]. Ibn Ḥibbān does the same [ath-Thiqāt 7/71]. But, he never meets and behold Umm-ul-Mu’minīnra as explained by Abū Ḥātim. Thus, this ḥadīth is actually munqaṭi‘ [al-Marāsīl p. 127]. Munqaṭi‘ is one of the kinds of the weak narrations. How can the weak become the strong? Yet, let us take a heed to his reason of affirming it. In his Silsilah al-Aḥādīth aṣ-Ṣaḥīḥah (no. 162), he brings a mutāba‘ah for ‘Abd-ur-Raḥmān ibn Sa‘īd which uplifts that sanad to be higher: From Abd-ur-Raḥmān ibn Sa‘īd ibn Wahb al-Hamdānī, from Abū Ḥāzim, from Ḥaḍrat Abū Hurayrahra [Jāmi‘ al-Bayān, 17/70]. This sanad is muttaṣil and ṣaḥīḥ. That sanad of Sunan Ibn Mājah is thus raised to be ṣaḥīḥ li ġayrihi, as it has mutāba‘ah from the Jāmi‘ al-Bayān’s sanad which is also centered in Abd-ur-Raḥmān ibn Sa‘īd. The difference of sanad between both the al-Mahdī ḥadīth and the ḥadīth above has the same case. In the deeds ḥadīth of Ibn Mājah, ‘Abd-ur-Raḥmān seems to have inqiṭā‘ with Umm-ul-Mu’minīnra. But, in the version of Tafsīr aṭ-Ṭabarī, ‘Abd-ur-Raḥmān virtually transmits it to Abū Ḥāzim to Ḥaḍrat Abū Hurayrahra to Ḥaḍrat ‘Ā’ishahra to Ḥaḍrat Rasūlu-LlāhSAW (marfū‘ mauṣūl). So, this ḥadīth comes to be ṣaḥīḥ li ġayrihi. Likewise, in the al-Mahdī ḥadīth from Abbān ibn Abī ‘Ayyāsh, al-Ḥasan seems to make irsāl. But, in the chain of Abbān ibn Ṣāliḥ, al-Ḥasan in fact transmits it to Sayyidunā Anasra. This sanad is thus uplifted to be ḥasan li ġayrihi. The status of Ibn Abī ‘Ayyāsh for being matrūk does not wound. As al-Imām Aḥmad ibn Ḥanbal says: Ḥadīth from weak narrators can be sometimes taken as ḥujjah occasionally, but what is munkar is munkar forever. Al-Marrūdhī gives an explanation towards it: If a weak narrator narrates a non-munkar narration, it can be benefited as i‘tibār. As for munkar narration, whether it is from weak or strong narrator, it can not be noticed, looked, because the error is obvious within [‘Ilal al-Marrūdhī p. 287; Sharḥ al-‘Ilal Li Ibn Rajab al-Ḥanbalī 1/385]. حدثنا الوليد بن عتبة؛ عن زائدة، عن ليث، عن مجاهد، قال: المهدي عيسى ابن مريم. حدثنا الوليد؛ قال: سمعت رجلا يحدث قوما، فقال: المهديون ثلاثة: مهدي الخير وهو عمر بن عبد العزيز، ومهدي الدم وهو الذي تسكن عليه الدماء، ومهدي الدين عيسى ابن مريم عليه السلام تسلم أمته في زمانه. إن هناك فريقا كبيرا من كبار رجال السنة والجماعة يقولون لا مهدي إلا عيسى. وعند التأمل لا يتنافيان، بل يكون المراد من ذلك أن المهدي حقا هو عيسى ابن مريم. The claim of al-ittifāq is not proven to be correct. I have already granted you a proof that Ibn Kathīr regards it ṣaḥīḥ. Is al-Ḥāfiẓ Ibn Kathīr ad-Dimashqī not counted among muḥaddithīn? Also, both Mujāhid and al-Walīd aḥādīth coherently express to us that the belief that there is no Mahdī except Jesusas had already been famed, notorious, and widely-known since the early age of Islām. The statement of aṭ-Ṭibī extremely corroborates this fact. It is an undoubted fact which anyone is not capable to deny. As for ijtihād of the scholars such as Mullā ‘Alī al-Qārī’, aṭ-Ṭayyibī, Ibn Taimiyyah, etc, every Aḥmadī always respects each and every of them in personal and esteems them in a very honourable place. But, just as ordinary men, it is very possible for them to mistake. So, although their ijtihād is wrong, they still deserve and receive one reward, as enlightened in aḥādīth. 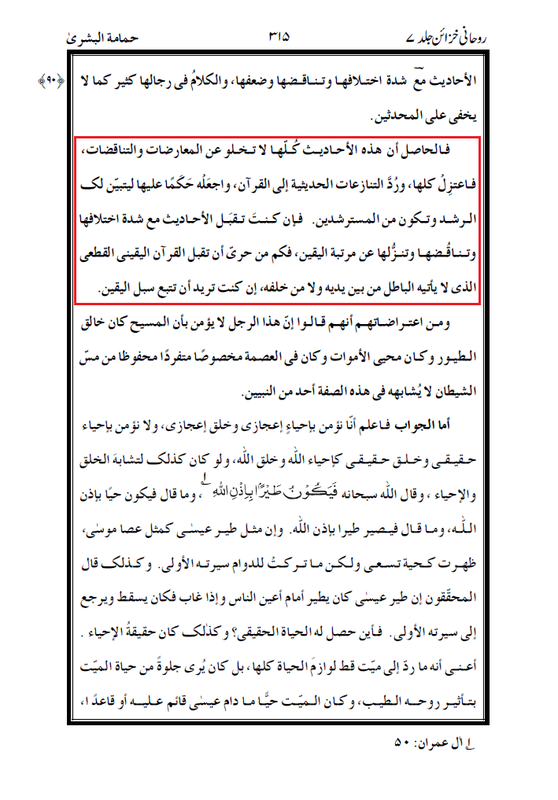 Waqar’s claim that Ḥaḍrat Mirzā Ghulām Aḥmad al-Qādiyānīas accepts that ḥadīth as ḍa‘īf is absolutely a lie and humbug. La‘natu-Llāhi ‘Alā al-Kādhibīn! Curse of Allāh be upon liars! He takes conclusion in a very slapdash and frivolous manner. He does not do a nice and conscientious research. I say, it is a fraudulent trick to deceit lay readers. If he were a bit honest, there is adverb ḥattā which excludes the khabar ﴾Lā Mahdiyya Illā ‘Īsā﴿ to be among the weak-criticized aḥādīth. The adverb ḥattā above settles on the office of illā which means except [Muġnī al-Labīb 2/260]. So, the ḥadīth that there is no Mahdī except Jesusas is exempted. حدثنا الوليد؛ عن شيخ، عن الزهري، عن عروة، عن عائشة رضي الله عنها، عن النبي صلى الله عليه وسلم، قال: هو رجل من عترتي، يقاتل على سنتي كما قاتلت أنا على الوحي. Adh-Dhahabī says on him: He is among the keepers of the knowledge (ḥadīth). He is thiqah ḥāfiẓ, but bad of tadlīs. If he says ḥaddathanā, it can be taken as ḥujjah [Siyar A‘lām an-Nubalā’ 9/212]. In another book, he says: He is thiqah, but performs tadlīs from weak narrators. If he is wanted to be taken as ḥujjah, he must profess with simā‘ (ḥaddathanā, akhbaranā, anba’anā, or sami‘tu). If he says ‘an (from), it can not be taken as ḥujjah [Man Tukullima Fīhi Wa Huwa Muwaththaq p. 533]. He says in another place: He is thiqah mudallis. His ḥadīth should be feared if he says ‘an [Al-Kāshif 2/355] Abū Mushir says: al-Walīd ibn Muslim performs tadlīs from liars. According to ad-Dāruquṭnī, he performs tadlīs from Shuyūkh (teachers) of al-Auzā‘ī who are weak to him [Siyar A‘lām an-Nubalā’ 9/216]. In that ḥadīth, he uses ‘an from an unknown Shaykh. It means, this ḥadīth is nothing. This Shaykh is mubham (vague). 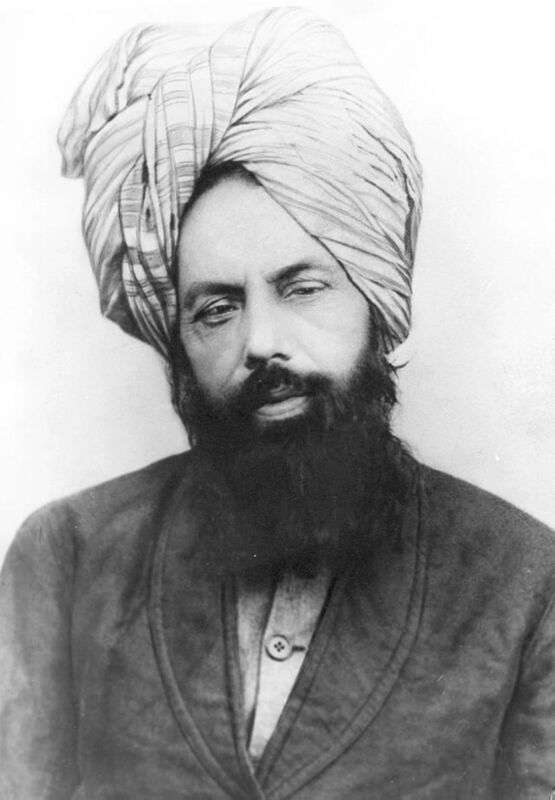 This ḥadīts thus becomes mubham as this man is therein. Let alone the Shuyūkh whom al-Walīd narrates from are weak liars. Built on the agreement of the scholars of ḥadīth, mubham is considered among weak narrations. This khabar brightly declares that al-Mahdīas is a Caliph of God. حدثنا محمد بن يحيى وأحمد بن يوسف؛ قالا: حدثنا عبد الرزاق؛ عن سفيان الثوري، عن خالد الحذاء، عن أبي قلابة، عن أبي أسماء الرحبي، عن ثوبان، قال: قال رسول الله صلى الله عليه وسلم: يقتتل عند كنزكم ثلاثة، كلهم ابن خليفة، ثم لا يصير إلى واحد منهم، ثم تطلع الرايات السود من قبل المشرق، فيقتلونكم قتلا لم يقتله قوم، ثم ذكر شيئا لا أحفظه، فقال: فإذا رأيتموه فبايعوه، ولو حبوا على الثلج، فإنه خليفة الله المهدي. It think it is a mistake from one of the narrators. It seems that it should have been “They are not from me”. Allāh knows the best! حدثنا عبد الله بن يزيد المقرئ المكي؛ حدثنا حيوة بن شريح؛ حدثني يزيد بن عبد الله بن الهاد؛ عن محمد بن إبراهيم بن الحارث، عن بسر بن سعيد، عن أبي قيس مولى عمرو بن العاص، عن عمرو بن العاص، أنه سمع رسول الله صلى الله عليه وسلم يقول: إذا حكم الحاكم فاجتهد ثم أصاب فله أجران وإذا حكم فاجتهد ثم أخطأ فله أجر. I'm not finished reading it, but, ma sha'a llah, great work! Where are you twitter, bro?